How does the lymphatic system help maintain water/electrolyte balance? By moving excess interstitial fluid (ISF) from interstitial spaces (ISS) into lymph, and back into blood. How does the lymphatic system help defend body tissues from infections? Where/how does the lymphatic system absorb fats? 3. Remaining ISF is moved by hydrostatic pressure into highly permeable ends of lymphatic capillaries and become "lymph"
How many liters of water and plasma protein enter the interstitial spaces each day? What does transcellular fluid (TCF) include? What ions does lymph contain high concentrations of? What ions does lymph contain low concentrations of? 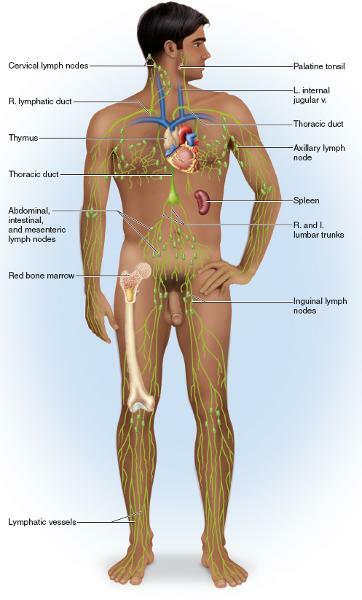 What are the major lymphatic organs? Help macrophages "filter" lymph by removing pathogens and foreign substances from lymph before it enters venous blood. What are the four MAJOR functions of the spleen? Why is the spleen known as the erythrocyte graveyard? What body parts can take over the function of the spleen if it is removed? What lymphatic tissues are associated with the mucosa/gut and where are they located? 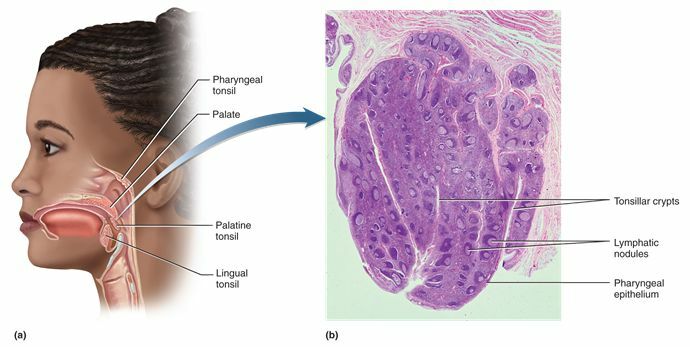 What are the three sets of tonsils and where are they located? Very permeable close-ended tube composed of simple squamous e.
What are the three layers of lymph vessels & what makes them up? How to lymph vessels move lymph? How many collecting ducts are there and where to they drain? -Drains L. head/neck, arm, thorax, entire abdomen and both legs.